Peanut Roots Soup - I asked on my Instagram stories, 40% replied that they cooked before while 60% were clueless about what Peanut Roots can do. 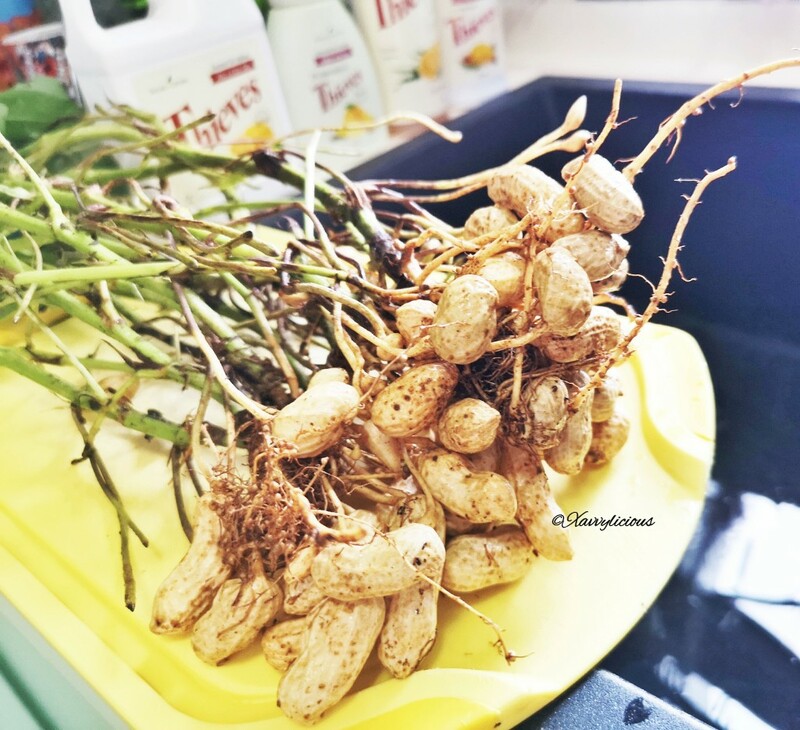 Infact, there is no scientific facts that Peanut Roots Soup can help to make a child grow taller. 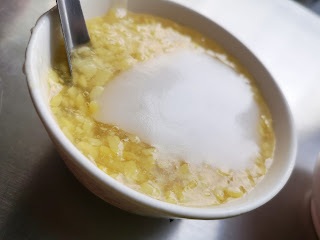 But if you do ask the older generation, this soup will be the most common answer. Less than $1.50, Don bought this from Sheng Shiong. I was taught by Xav's classmate's daddy to trim of the upper part of the stem, leaving an inch or two to the roots. Remove the leaves as it can be bitter but I read somewhere that the leaves help to promote better sleep. Washing off the soil can be a little tedious, I lost count the number of times I rinsed the roots and used a toothbrush to brush off the soil. 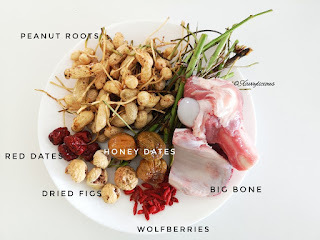 Combining with the rest of the ingredients like red dates, honey dates, wolfberries, dried figs and big bone, I put them all into the pressure cooker. Be sure to blanch the ribs first and remove the scum before adding it into the pot. 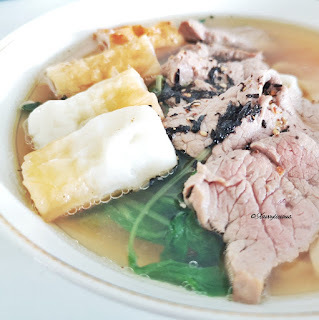 If you are not boiling using pressure cooker, bring to boil and simmer on low heat for two hours. Xav said that the soup tasted like the normal soups I cooked. But I find that it has the roasted nut taste and coupled with the sweetness from the dates, this soup tasted pretty nice. I cooked some noodles and added some beef slices and made it a meal for him. Some friends asked if this soup is heaty, honestly I have no idea. My take is, if you are concern about the soup being heaty, reduce the amount of red dates and wolfberries or just omit them. Otherwise, I still believe in taking everything in moderation. And I would advise not to feed to young kids 2 yo and below just to be cautious for any allergy reaction to peanuts. Happy boiling this cheap yet nutritious soup and do monitor if your kids do have a significant increase in their height and let me know! Thank you for reading and if you would like to stay tune for future updates, do follow me on Facebook, Pinterest and Instagram ! 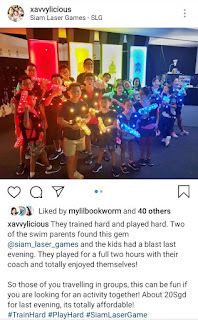 My annual break from mom duties was pretty much earlier for this year and to think we all made a mistake, unaware that MOE calender actually starts a week later and this trip totally clashed with Xavier's CA1. I tried my best to go through whatever I could with him before I departed and the rest which I could not finish, was up to him. Infact, this is something I wanted him to try and that is to self study without having me around. If you asked me any mom guilt during the trip, I would say no. This year, it was Jenn, PC and me, I think it is very important to plan for a trip with like-minded friends. 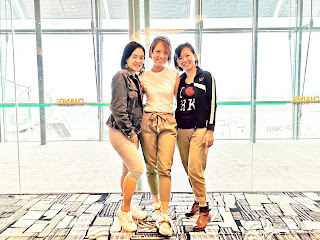 Last year, we discussed and decided to make Hong Kong our destination, a hiking trip it shall be since we do not really shop much and on International Women's Day, we flew! This trip, we were blessed to have two of PC's friends with us, here I share a summary of the trip! 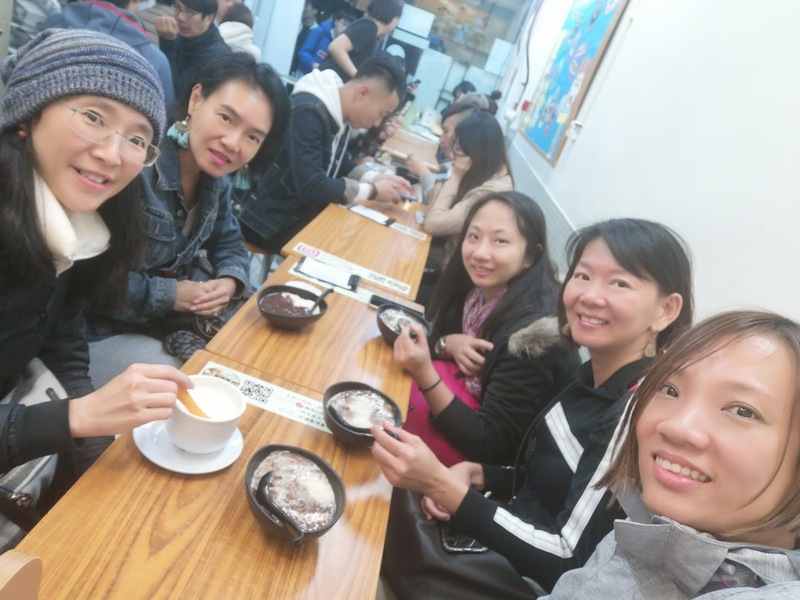 If you are looking for desserts apart from the well known Hui Lau Shan, we went to Sheung Tong [嚐糖] around the vicinity of Mong Kok. I would not say this was fantastically nice but I thought it was not too bad! 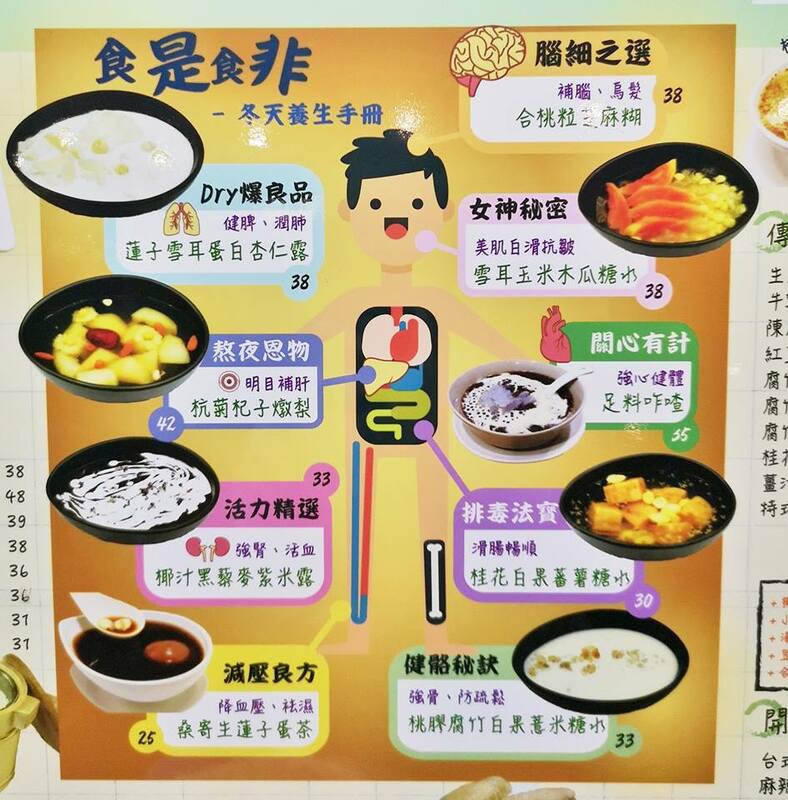 This menu with the health benefits stated caught my eye! Pretty interesting to find a variety of beans in it and sweetness level was just nice. Note the closure timing for their break. 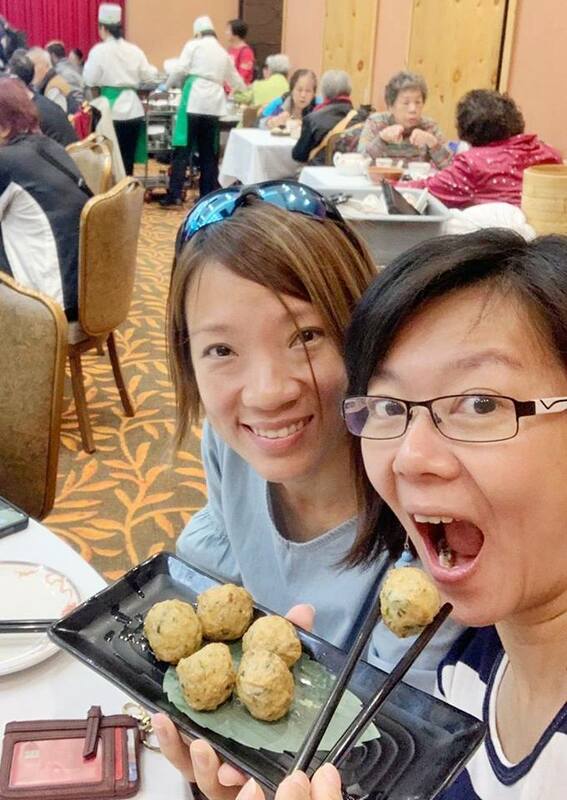 In the land of Dim Sum, I would not want to return to Singapore with regrets without having to eat any at all even though this was not meant to be a makan trip. We managed to check out three tradtional old-school type of dim-sum with the staff pushing the dim sum trolley from table to table. 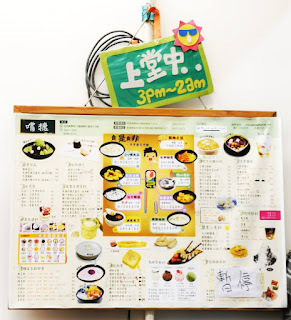 This restaurant is in Tsuen Wan just a few minutes walk away from our hotel- Panda Hotel. Nestled in the neighbourhood, in Hoi Lin Restaurant [海蓮茶楼] was mostly a scene of the locals enjoying their dim sum over tea and newspaper. I was googling and wanted to visit Duan Kee since it was not far from our hotel. I like traditional dim sum and that was why! 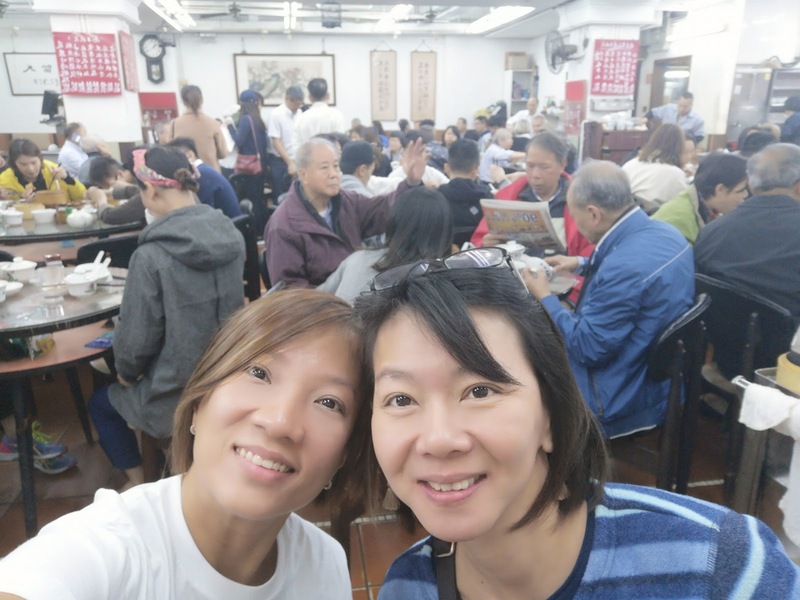 Second day, we planned to hike at Tai Mo Shan and our Hong Kong friend brought us to Choi Lung Restaurant, a renowned restaurant in the neighbourhood! 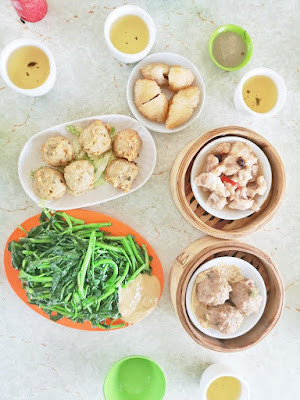 You can choose to go to the upper floor and enjoy the dim sum with a view but the lower floor was not too bad too! We sat in the open and really enjoyed the food and cooling weather. 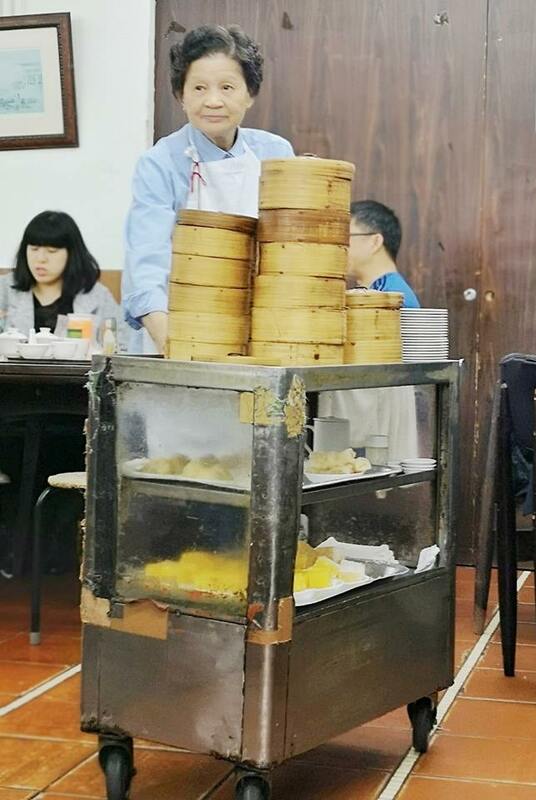 Expect no service here, from selecting the type of tea leaves, filling up the tea pot, to getting the dim sum you want, self service please. And are the must order? You have to give their very fresh blanched watercress 西洋菜 a try! 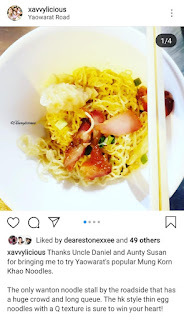 It came with blended fermented beancurd sauce, trust me it was really good when we dipped the vegetables to go along with the sauce. 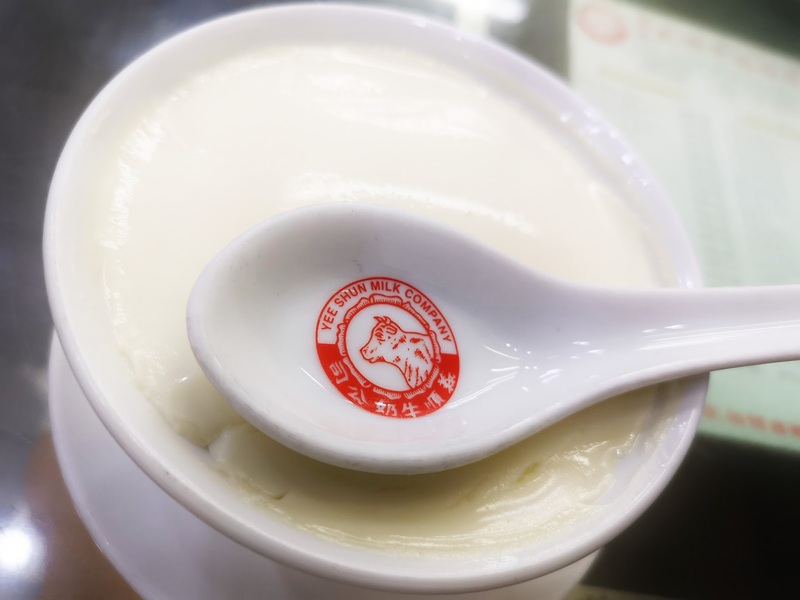 I read that their beancurd was a must try as well , made using spring water. now, why did I not read it earlier?! I did not managed to try that, this made it legit to revisit the next trip! Do try 咸水角 and 蚬蚧鲮鱼球 that came with lala dipping sauce, pretty special I felt! 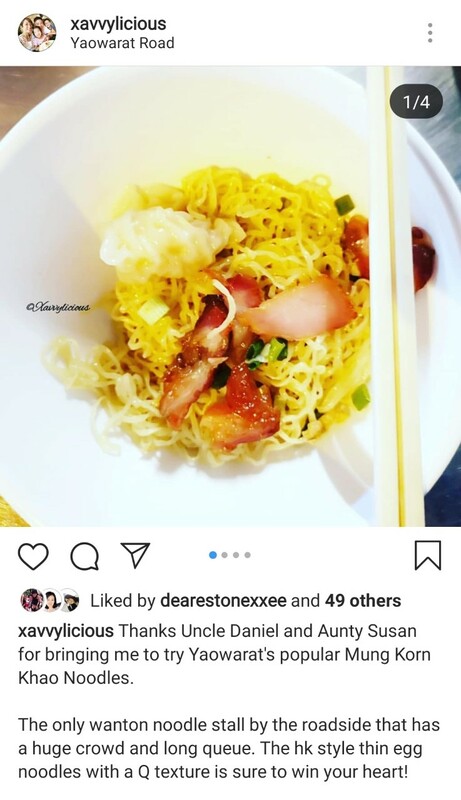 Incase if you are asking for this dish, in Cantonese, it is "Heem Gai Leng Yu Kou". It was delish! 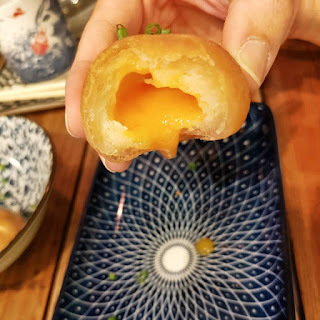 the bite was filled with firm fish paste and not starchy. This is rarely seen in most dim sum shops, black sesame roll. 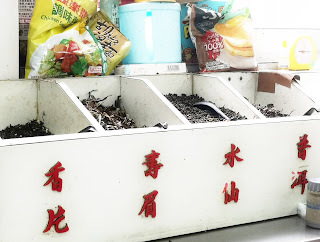 Good to try if you are a black sesame lover! 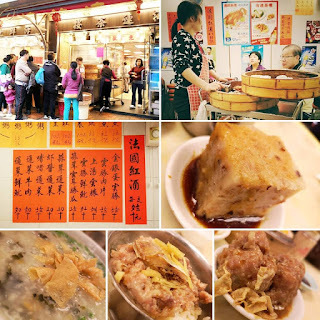 In the vicinity of Central, is where Hongkong's iconic traditional dim sum - Lin Heung Tea House 莲香楼 was. Hearsay that this restaurant would ceased operation in end February but it was still operating when we visited. To be honest, nothing much to rave about the quality of food. You have to be fast to get yourself seated and table sharing is a norm. Most of the patrons were made up of the older generation chit-chatting over tea, reading papers or analyzing horse-betting books. Should you visit the tea house, upon seated,get your order chit ready, catch hold of the passing trolleys, choose what you want and get your card chopped. 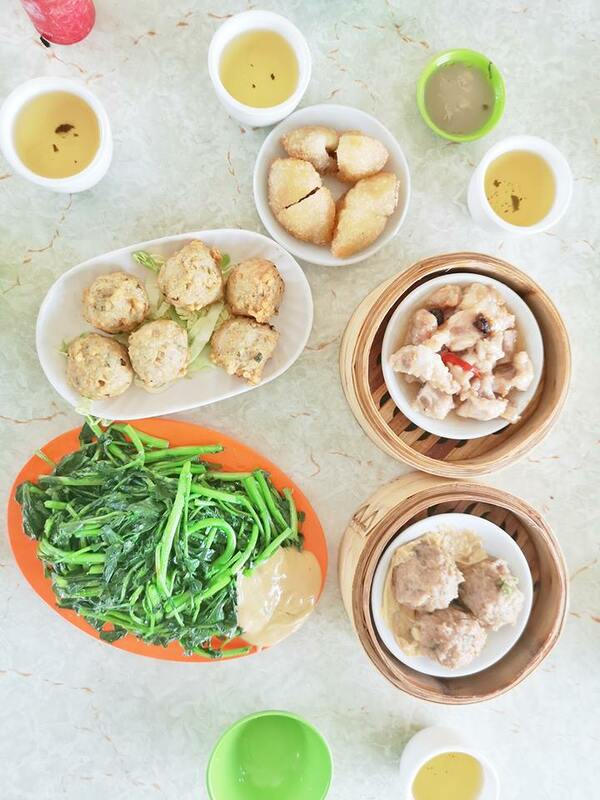 Popular dim sum like Har Kow is usually gone fast, so be kiasu abit and walk to the trolley instead of waiting for it to come by your table. 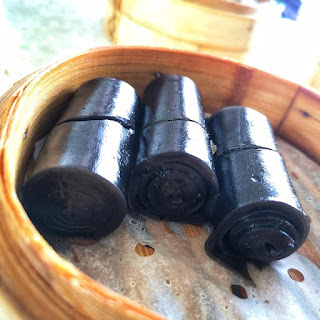 This dim sum below is similar to our Lor Mai Kai, the only dish I felt that it was really nice, the rest were below what I expected. This restaurant sells delicious walnut biscuits too. Get a few packs back would make great souvenirs! Last but not least, the fourth and the last dim sum restaurant we visited was Tao Heung Dim Sum. 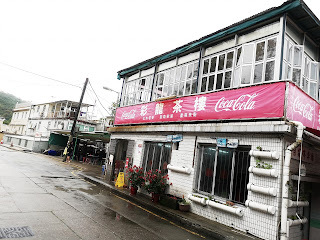 This name has plenty of branches and we managed to find one in Tsuen Wan by chance and we were told that all dim sum will be on 50% discount before 12pm. You bet that the restaurant was pretty full in the early morning with the locals. Found the dish we had at Choi Lung restaurant but we still gave our vote to the former! Nevertheless, this made PC happy! 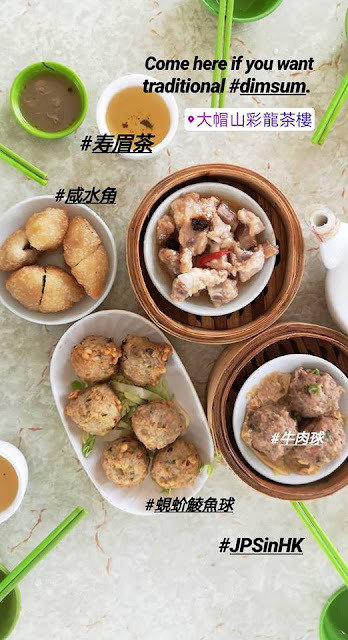 Click here to see the list of outlets in Hong Kong. 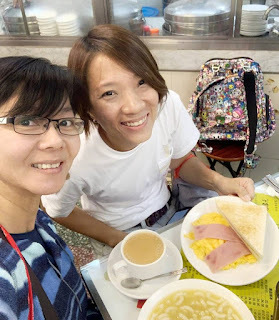 And of course, not forgetting the one everyone would be having under the must-eat when you mention about Hong Kong trip- Australian Diary Co, a traditional Cha Chaan Teng in Jordan. Pretty lucky for us, there was no queue and yes, pretty nice staff we offered a stool for my big bag. We shared a meal between us to prevent over-eating and satisfied! Yee Shun Milk Company's steamed ginger milk pudding is a must for me whenever I made the visit. Eat it either hot or chilled, both tasted equally nice. I managed to step into one of the cafes while looking for Don's shoes along Nathan Road. I am all satisfied !! Linking up with my Hong Kong trip 2016 for more makan hunts! Hope you have enjoyed reading thus far! Drop me a comment if you have any nice recommendation to share! 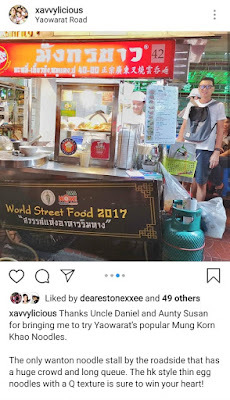 Disclaimer: This is a totally non-sponsored post, I am most happy to share my travel experience to all and hope it has been helpful with certain information. We were invited to attend the launch of The Great Singapore Poo Sale and Other Beastly Business (Second Edition), at Woods In The Books, a pleasant, little bookshop nestled in the neighbourhood of Tiong Bahru. 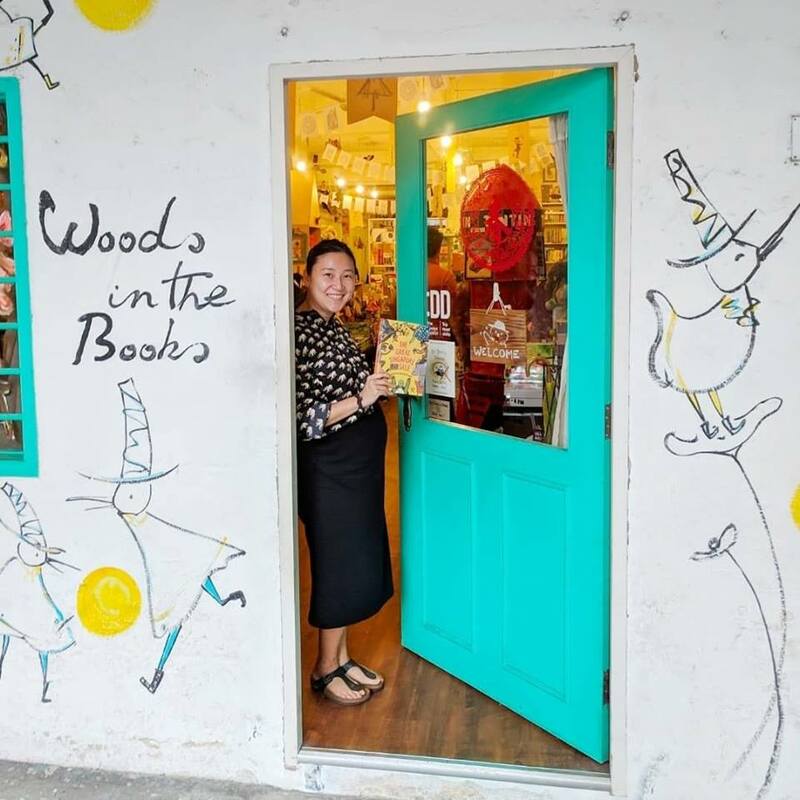 This bookshop carries beautiful picture books as well as books for the young. 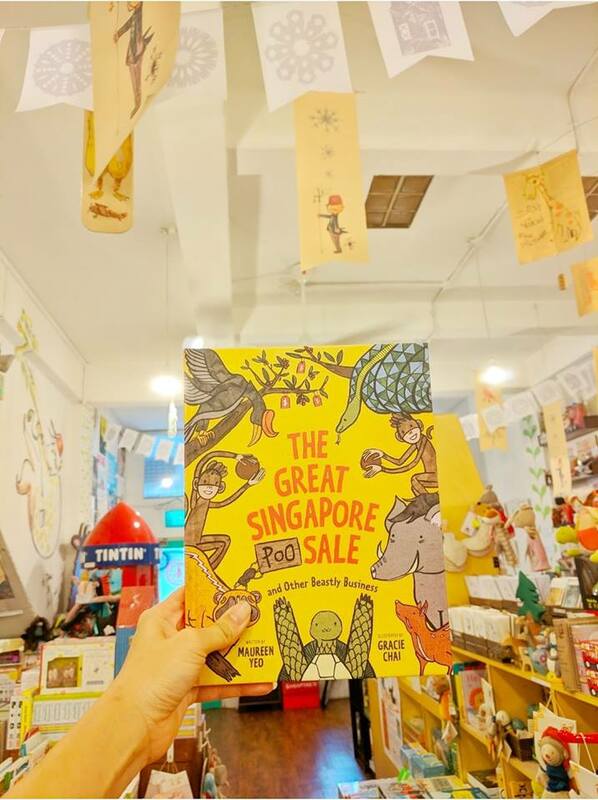 This is the second edition of Epigram children's books written by our local author, Maureen Yeo and the illustrations were beautifully illustrated by Gracie Chai , with the first edition sold out within half a year! This beautiful book tells us about our very local animals under threat and Alpha Macaque, together with his troop decided to plan and embark on an adventure to rewrite the Constitution. 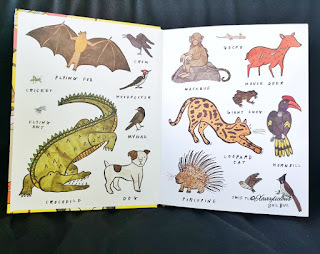 The book advocates on conservation and personally, I think this is a suitable read for Primary 3 onwards (for independant readers) as well as for adults, who wish to to have a short read. 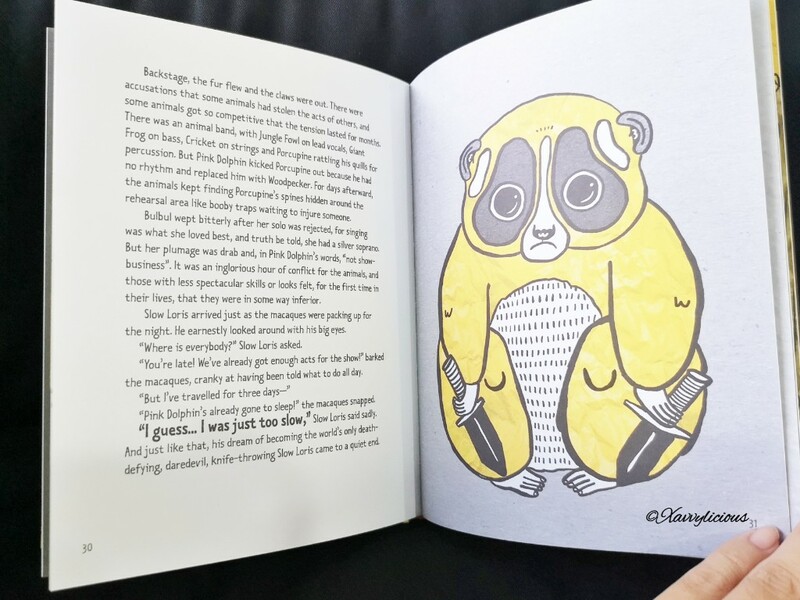 This endearing story teaches both children and adults to be more compassionate towards animals and nature! As for children younger than 9yo, parents can read to them as a bonding activity, introduce new vocabulary to help their vocabulary bank grows as Maureen had added adjectives to bring live to the animals and at the same time children learns certain animal behavioural too! It may seemed wordy for the young readers but wait, flip open the front and back of the book, printed on them were beautiful illustration of 35 land and sea animals and through out all the 5 chapters! I loved the illustration of the Slow Loris most! It would be nice to have them printed on merchadise like tote bags, folders or even pencil cases! 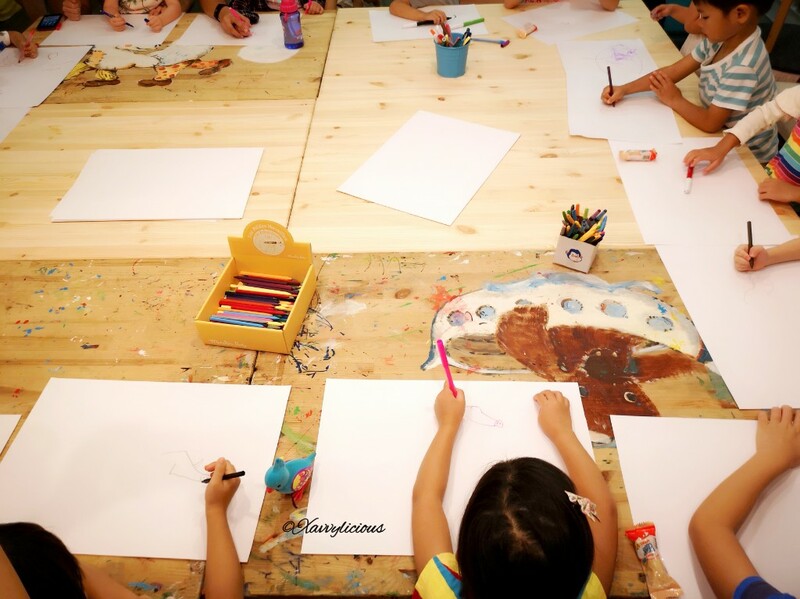 You can get artistic with your child at home, following the beautiful drawing, pull out the drawing papers anytime and doodle! During after the story-telling session, the children were seated around the table, armed with papers and pencils and doodled away as Gracie gave a live, step-by-step demostration on how to draw a really adorable boar! When the nose of the wild boar got a little longer, it could actually looked like a baby elephant! The Great Singapore Poo Sale and Other Beastly Business is a book about some animals trying to protect their homes from being destroyed by us, human beings. 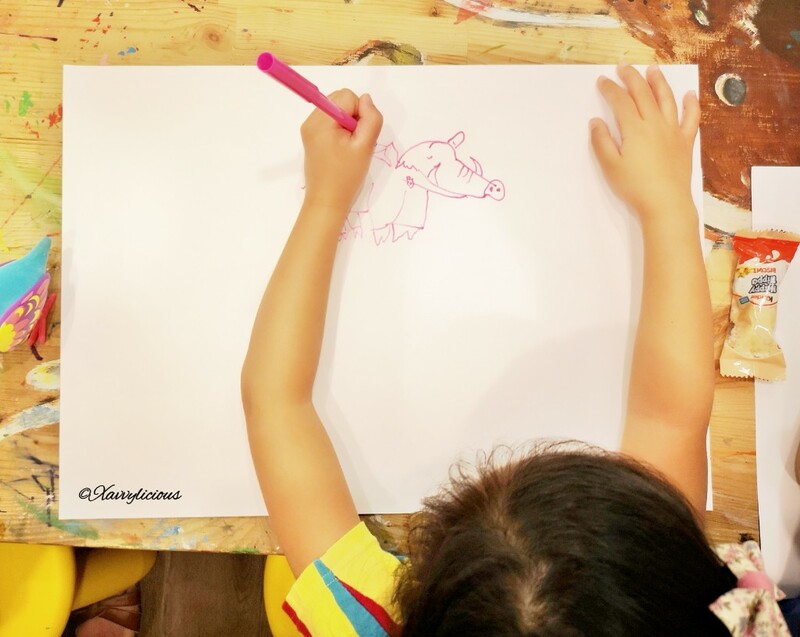 The animals used their wits and creatively came up with various and funny methods. Will their efforts to save the forest be in vain? Go, buy this book and find out the ending! I really love this book as the events in this book are really surprising and hilarious, illustrations in this book clearly describes what is happening in the story and are really adorable! If you would like a signed copy with a personalised message, go ahead and drop Maureen a PM on Instagram! 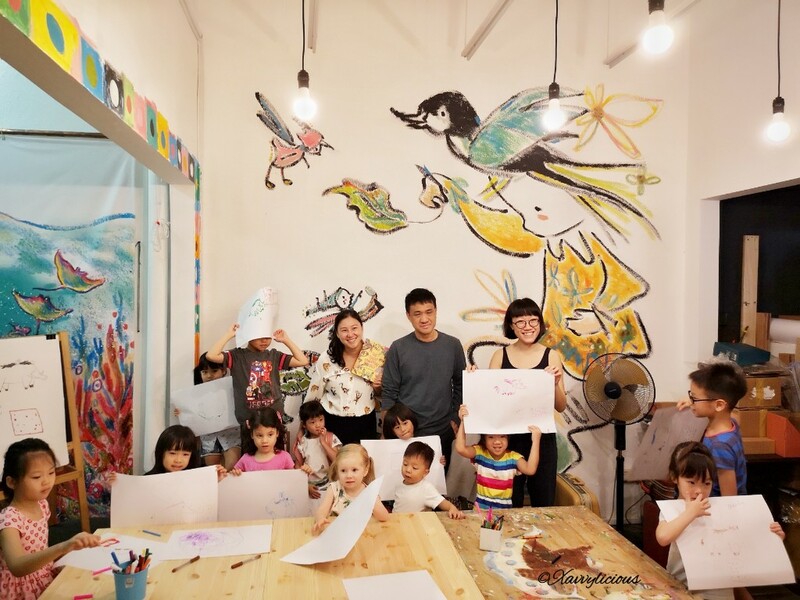 Maureen Yeo teaches English, Literature and life skills by introducing her young children to Roald Dahl's great principle: "A little nonsense now and then is realished by the wisest men". 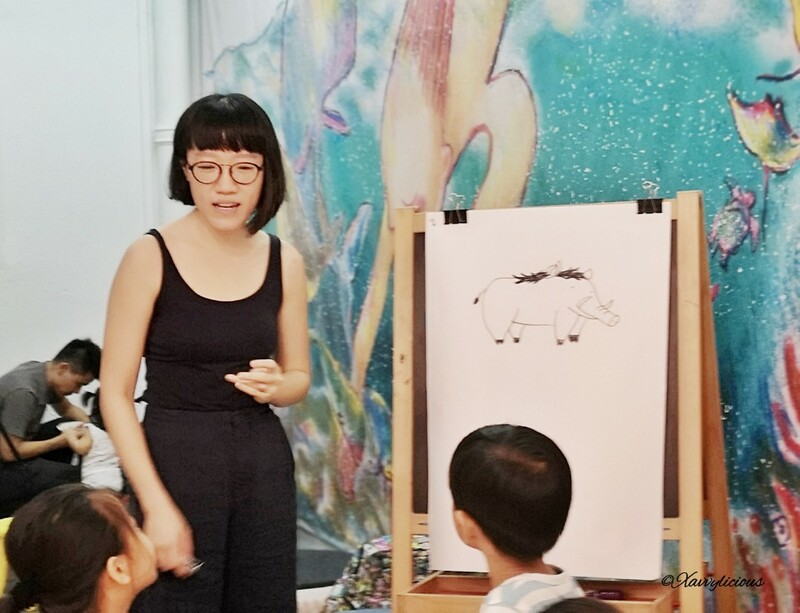 When not working, she seeks out adventures at home and abroad, especially wildlife encounters. Some of these adventures have been documented as travel articles for Today newspaper. Gracie Chai is a self-taught illustrator and artist who has dabbled in textile fabrication and clothes making. 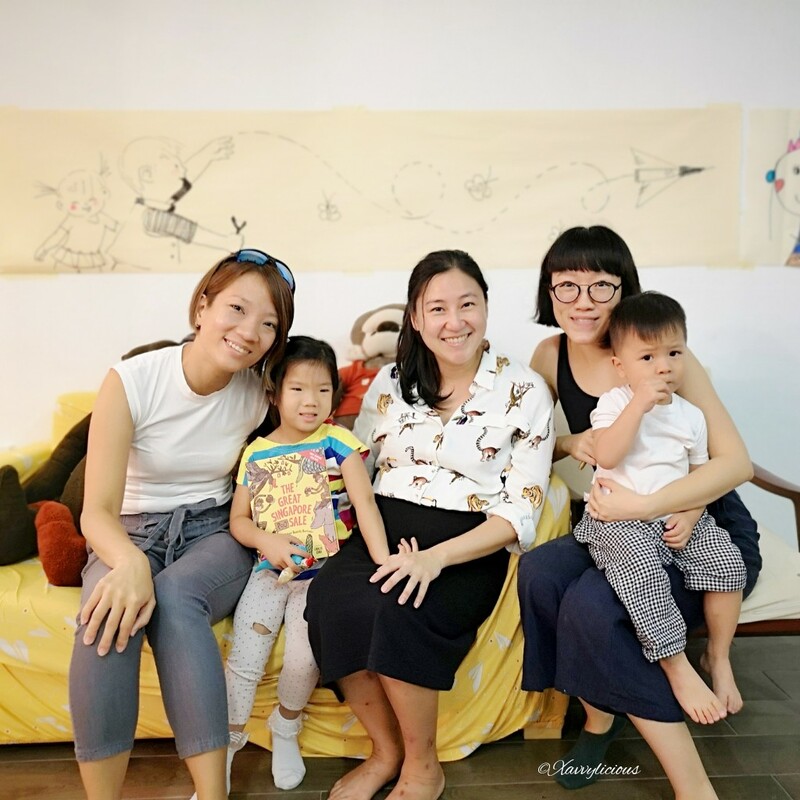 She has sold her handmade dresses and accessories in various parts of the world and had her works featured in international and local publications. Her attention has now returned to illustrating - her first artistic passion. If you have enjoyed reading my posts, do follow me on Facebook, Pinterest and Instagram ! All my growing up years right up till I became a mother of one in 2008 , I always had a skinny frame and could actually fit into the largest size of kids' apparels. 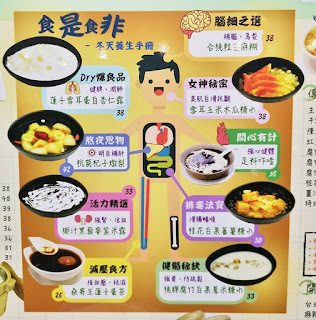 However, as I am slowly inching towards my 40s in 3 years' time, I felt that my metabolism is slowing down and yes, unwanted stubborn fat started forming. 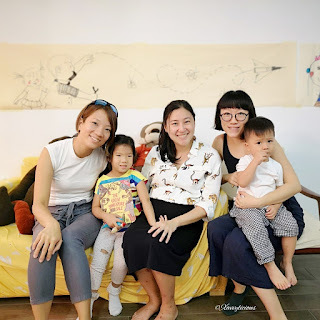 These five years, after the second child birth in 2013, I realised that I am gradually 'growing'. I felt that my tees and shorts were getting a little tight on the tummy and thighs and I have upgraded from XS to M when shopping for clothes. 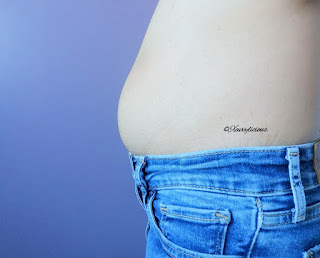 Never did I thought of going through fat removal treatment until this recent one year, when that extra pocket of bulging fat became more challenging to handle. From a two-piece swimwear, now I go for one piece, just to hide them all. I have to say, I am most conscious about my thighs and tummy especially. Blame noone but myself for those late night snacking and my weight increased by a kilogram within two weeks! When I lost my self-control to those yummy yet fattening CNY goodies, I binged and finished tubs even before Chinese New Year was here. Now, I regretted big time! 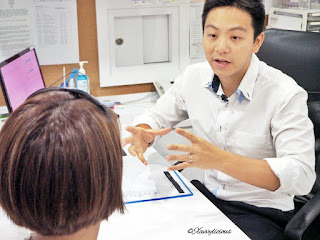 This was when I decided to consult Dr Winston Lin from Elissa Medical Clinic to find out more about CoolSculpting. This is my first time consulting for an aesthetic treatment, I hope the following information below will be of use to you too if you are a first timer like me. A: CoolSculpting is also known as fat-freezing, a non-invasive fat removal treatment approved by the US Food and Drug Administration (FDA). 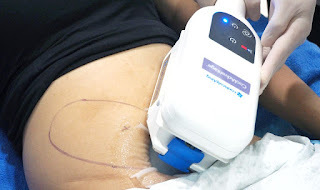 In technical terms, it is known as Cryolipolysis, a technology which freezes and destroys unwanted fat cells which are then disposed from the body naturally. 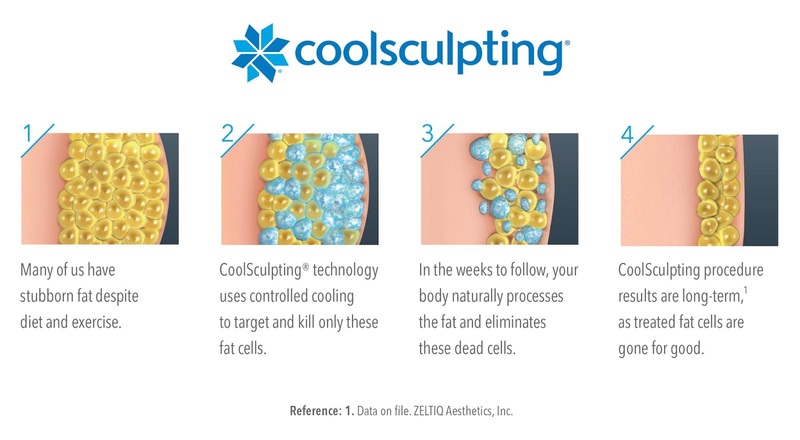 Q: Which areas can we do CoolSculpting treatment on? A: It is usually the abdomen, inner and outer thighs, flanks (love handles), bra fats, arms, knees and even double chin! Q: Will it be an immediate effect and will the fats be 100% gone after the treatment? A: You can only see the effect after 3 months. It works in such a way that the procedure targets and cools fat cells to temperature that trigger fat cell apoptosis. 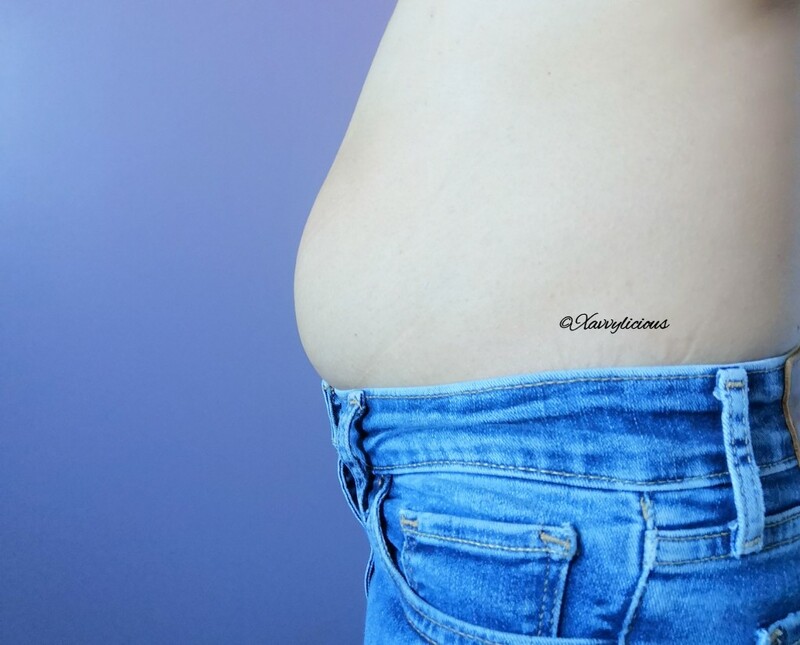 CoolSculpting selectively damages subcutaneous fatty tissue while preserving the skin and surrounding tissues. Following the treatment, the fats cells enter apoptosis and are destroyed. The body's immune system naturally processes the dead fat cells, which will be eliminated over the months. And because our body is unable to produce any new fat cells after five years of age, the fat cells that die after fat freezing will be gone forever. 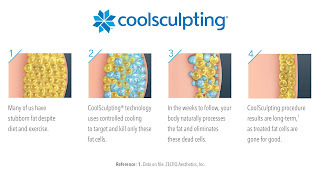 CoolSculpting treatment usually reduces the fat cells by 20-25%. Having said this, that does not mean we can indulge in feasting, as it will cause the remaining fat cells to grow bigger and form bulging fat again. We still have to complement the after-treatment with a healthier diet and lifestyle to maintain a long lasting result. A: Being a non-invasive procedure, discomfort is minimal. There is also no down-time for recovery and this treatment will not disrupt your normal routine, you can still function as normal. Q: What is the duration of one treatment ? A: One treatment usually lasts about 35 mins and it targets only one problematic area on your body (see picture below). Q: Do I need to prepare myself like fast before the treatment? A: Nope, nothing needs to be done, just be like any other normal days. Q: Is CoolSculpting suitable for all people? A: CoolSculpting is a fat reduction programme and not a weight-loss programme. But as the treatment plan will differ from person to person, it is good to consult a professional doctor first. The doctor takes some measurements and assess your requirements before prescribing a treatment plan just for you. Dr. Winston Lin has been very patient in answering all my questions and was very reassuring that CoolSculpting is a very safe procedure. I have decided to go for the treatment and will share in details about the treatment process and my results in my next post, so do stay tune! Meanwhile, here is a quick video that summarizes my treatment process. It provides a wide array of health and wellness services that are dedicated to quality patient care. The doctors are focused on delivering optimised healthcare services that address the specific needs of their patients. Conveniently located in Hougang 1 shopping mall, Elissa Medical Clinic is a spacious and modern facility that has a special focus on medical aesthetics, weight management, and fat removal with CoolSculpting®. By bringing in the latest fat reduction technology, like CoolSculpting, and pairing it with slimming strategies, Elissa Medical Clinic hopes to make it easier and quicker for people to achieve their ideal weight and body contouring goals. Online appointment booking is also available here. 2018, a year when my passport had an overdosed of Thailand immigration stamps. 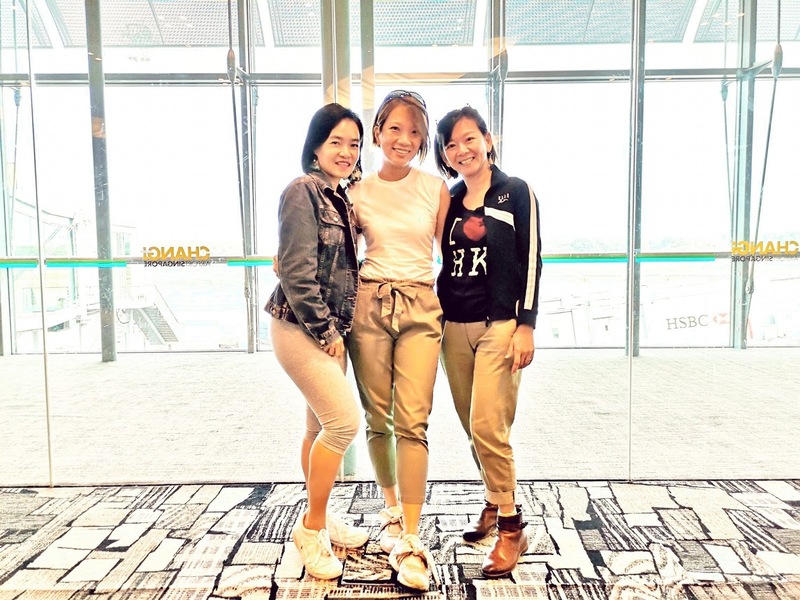 First quarter of the year was an all moms' trip to Bangkok #JCSinBKK. 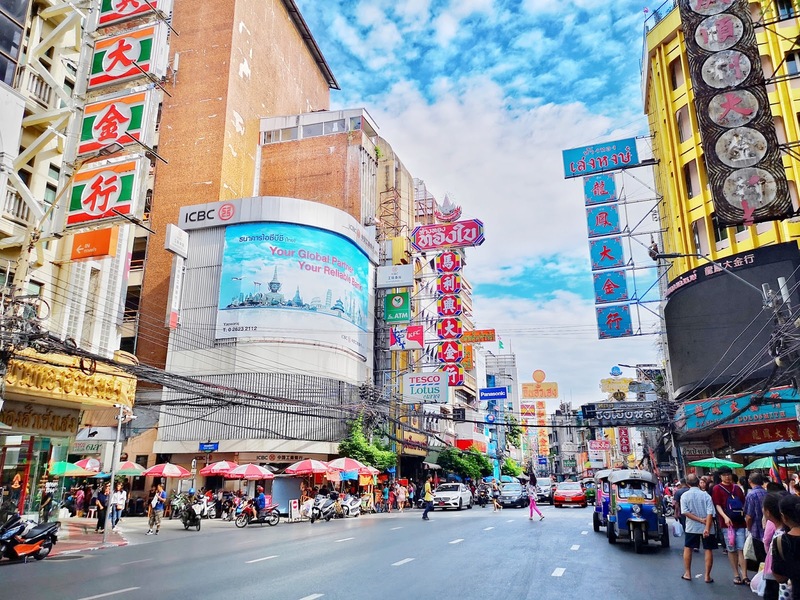 In September, we made a sudden decision to go for a 6D5N stay in Hua Hin and we had planned for Chiang Mai in December. 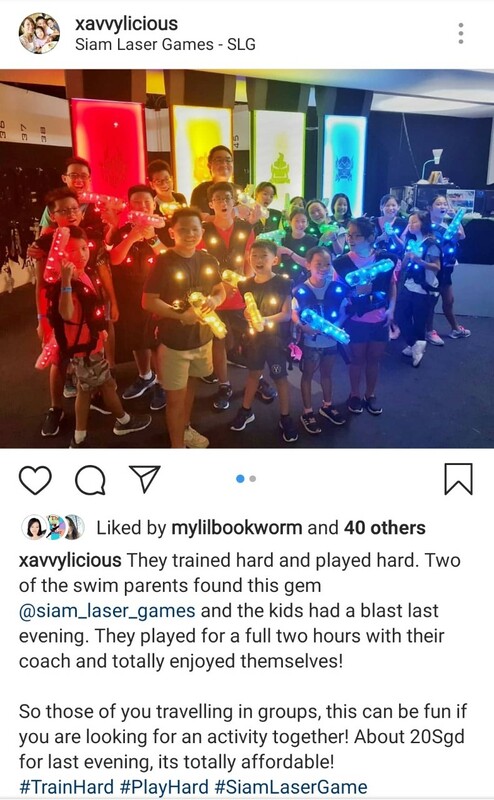 Unexpectedly, Xav happened to join the Royal Bangkok Sports Club 2018 swim meet right after the swim camp which was also held in Bangkok. The returning date after the RBSC meet was just one day before the departure date for Chiang Mai from Singapore. Long story short, I was at the Land of smiles for at least 2 weeks with the mission of having to eyeball Xavier but that did not stop me from being able to explore the place and discover new things! Are you ready? Let's go! 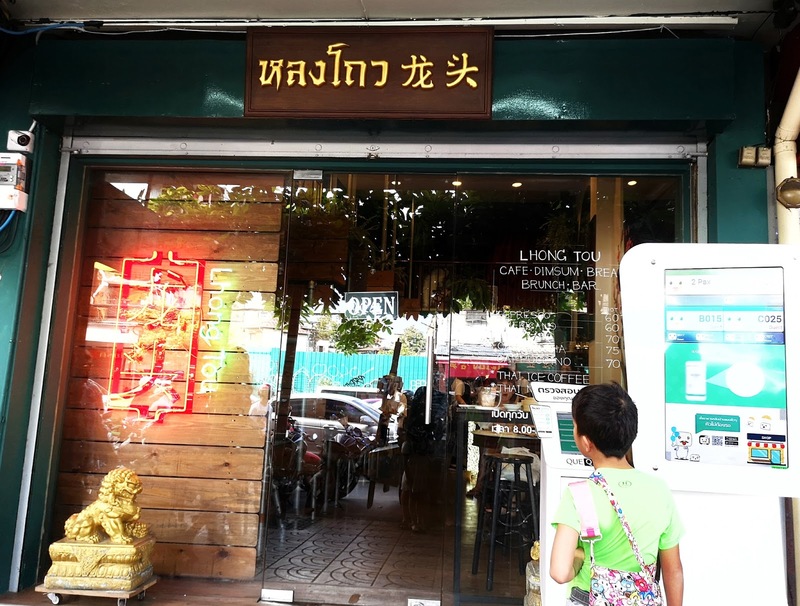 Yaowarat is always on my to-go list whenever we are in Bangkok. 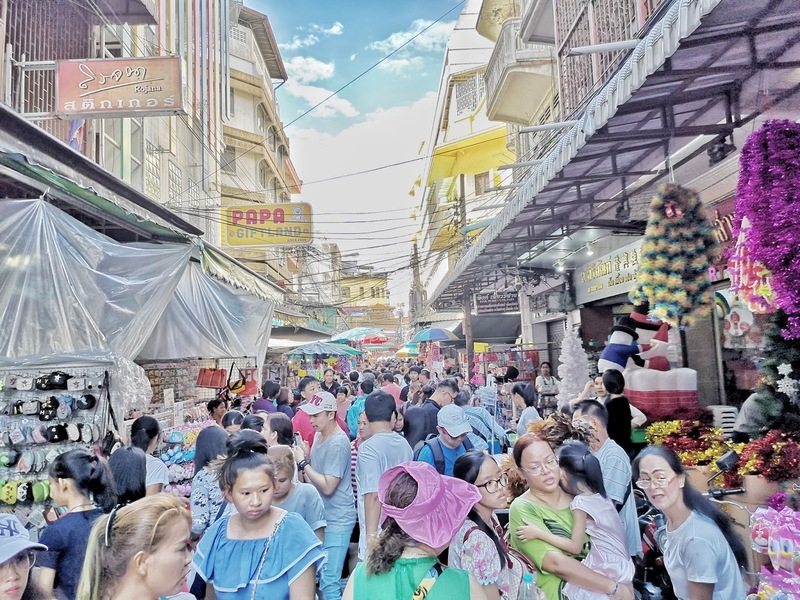 Chinatown by day and night are the same, eating and shopping. 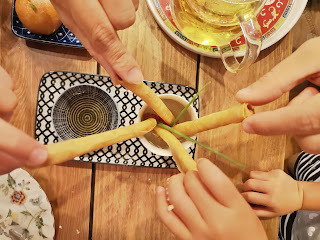 We still visit our usual eating haunts but this time, we stayed till the night as the kids can sustain longer hours walking with us. 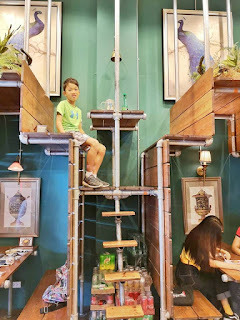 This time, before we headed for our wholesale shopping, we visited the instagram worthy Lhong Tou Cafe. 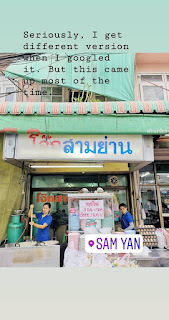 When we arrived there, there was already a short and slow moving queue. We were assigned to the tables on ground level based on availabilty. Shortly after, the table on the upper level was vacant. Xav took the chance and quickly went up to have a picture taken. 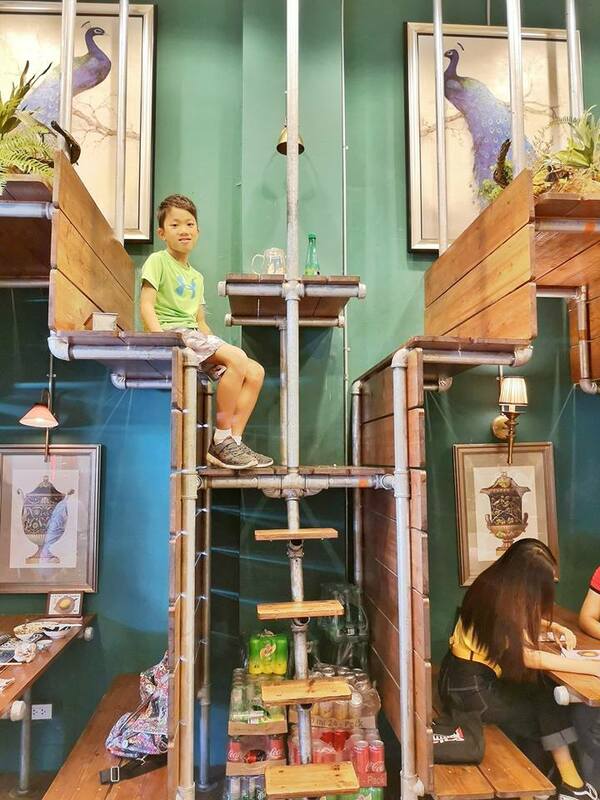 Kids being kids, they just love climbing! 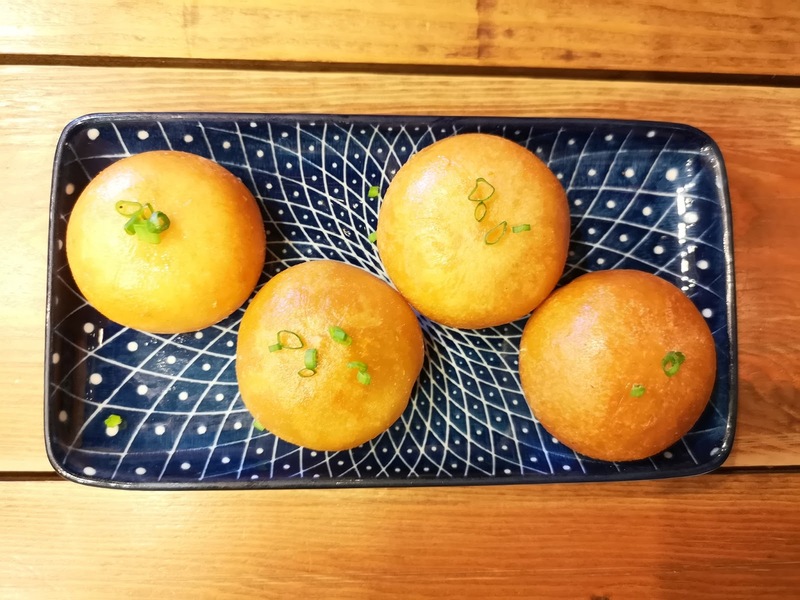 To be frank, do not expect an extensive menu, we asked the staff for their recommendation and ordered these. 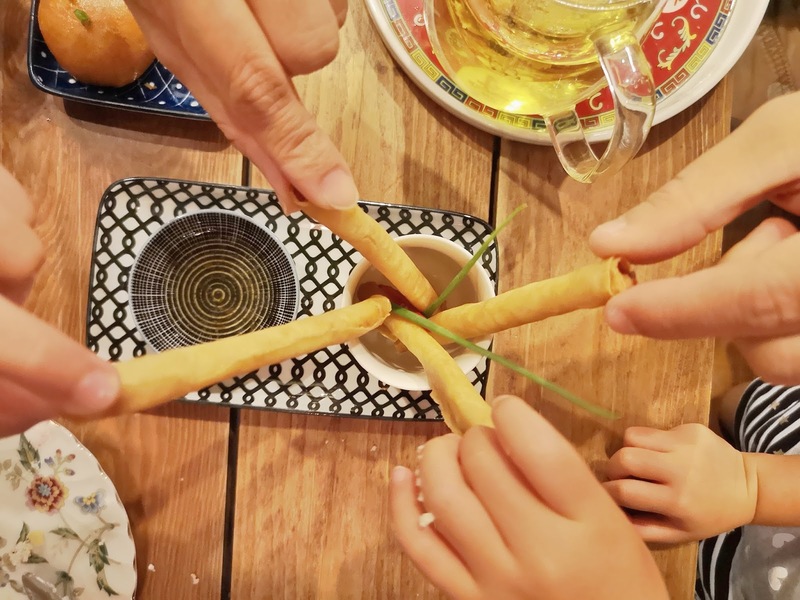 The spring rolls were just nice, one each and gone in less than a minute. The flowy egg lava bun, MUST order ! 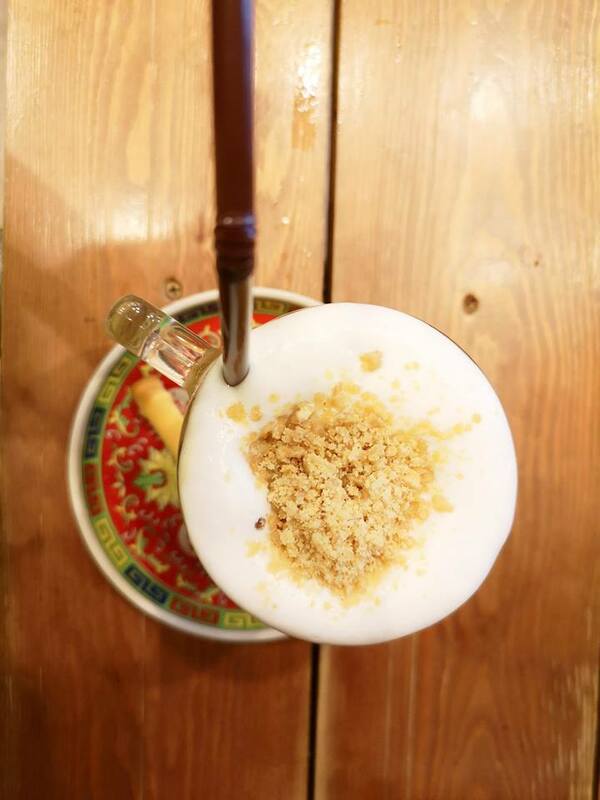 One of a kind Lhong Tou Thai Milk Tea, good to try! Next up, we headed to our usual haunt to have our pig blood cravings at Nai Ek Rice Noodles just further up front. And finally, I managed to try the desserts just next to the shop after umpteenth visits. 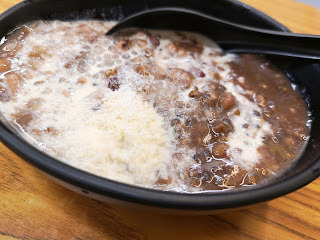 Eat the Tau Suan piping hot, I liked it with a bit coconut milk. Meanwhile, The Thai version Bo-Bo Cha-Cha was a tad too sweet for my liking. 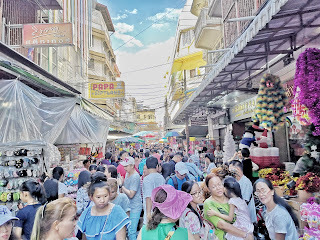 Day time is as usual, eat and shop the wholesale area, I have got some stationeries and decent stuff for the party bags and that was not all. food stalls. During Xav's swim camp, I made new friends. 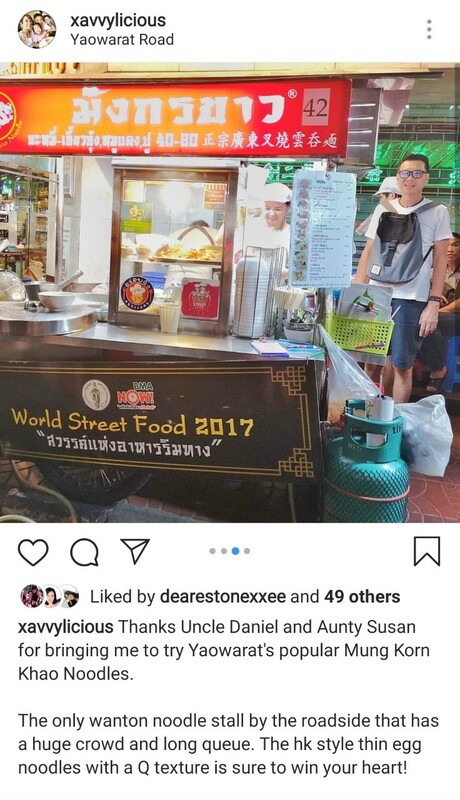 Uncle Daniel and Aunty Sue brought me out to try Yaowarat's popular Mung Korn Khao Noodles. 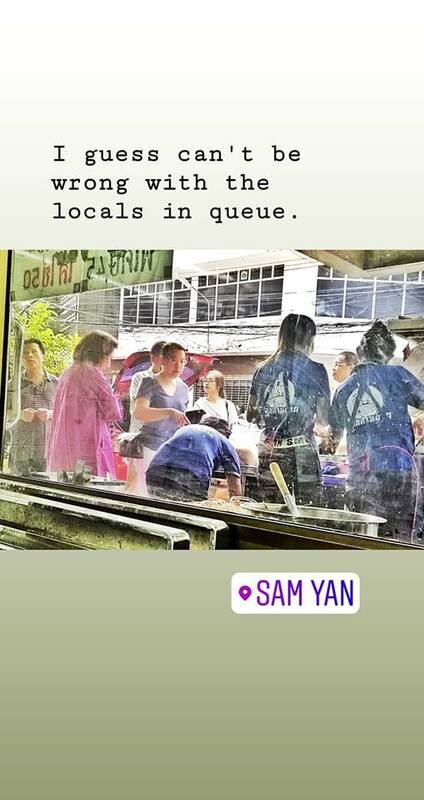 This is the only wanton noodles stall by the roadside usually with a huge crowd or long queue just right beside the stall. 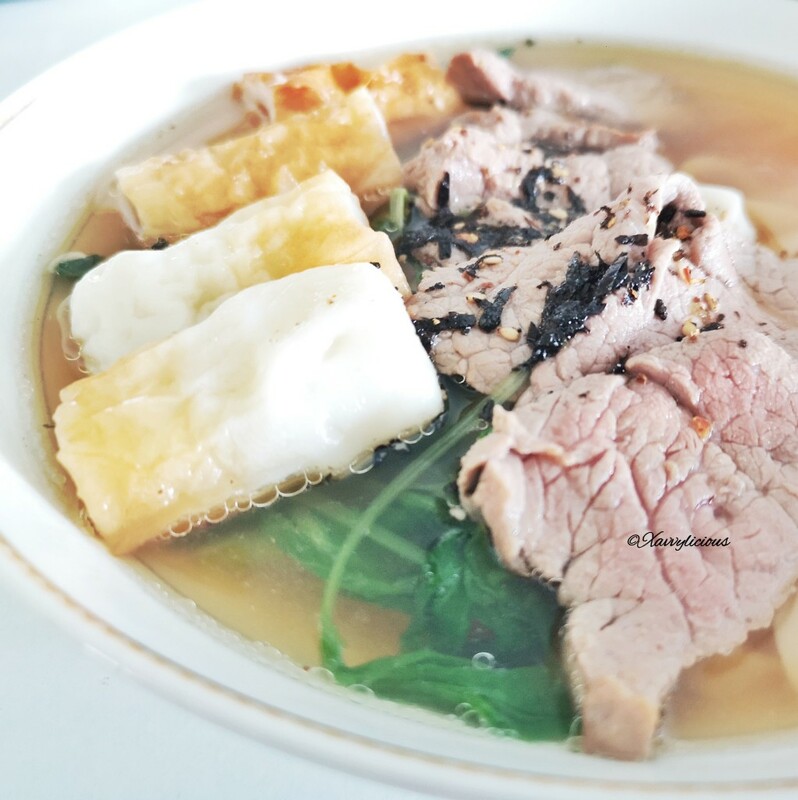 Be sure to love that Hongkong style thin egg noodles, the springy noodles is sure to win your hearts! 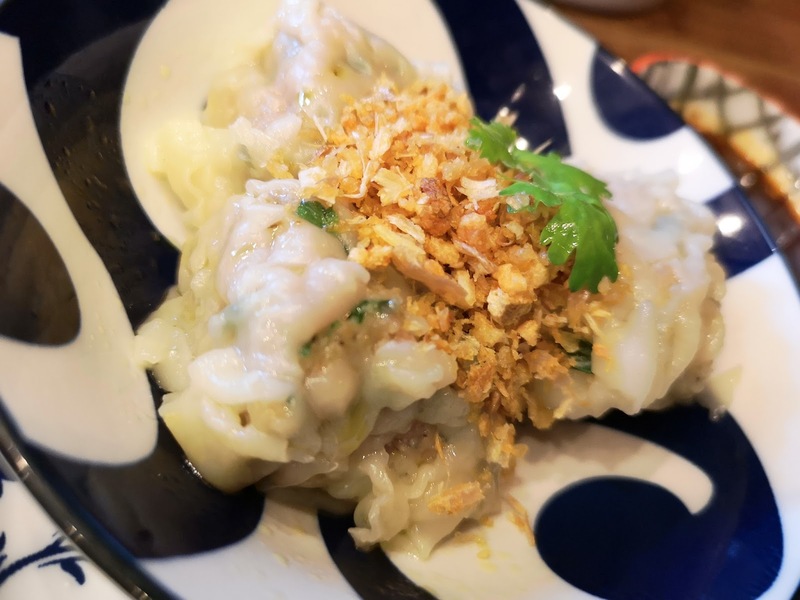 The wanton soup was flavourful too with a generous filling of minced meat and prawns. He even packed a few backs back to the hotel as supper. Go earlier if you do not want to wait in the queue but I think it operates at 6 or 6.30pm. 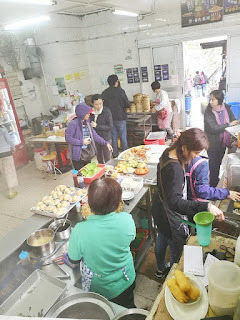 There was a chwee kuey cart just steps away from the wanton noodle stall, facing the road. Good to try if you want a taste of the Thai version. 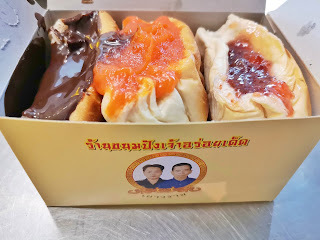 Pretty generous topping but the kuay's texture is firmer than Singapore's style. Follow by this famous toast which was always seen with long queues on the clips shared by my friends on social media. The queue for this bread toast was horrendous but I had to buy and try to see what was the rave about. You have to fill up an order form, submit, make your payment and wait for your number to be called once the toast is ready for collection. It was basically a soft and warm toast with pocket full of jam (chooose the choice of your filings). 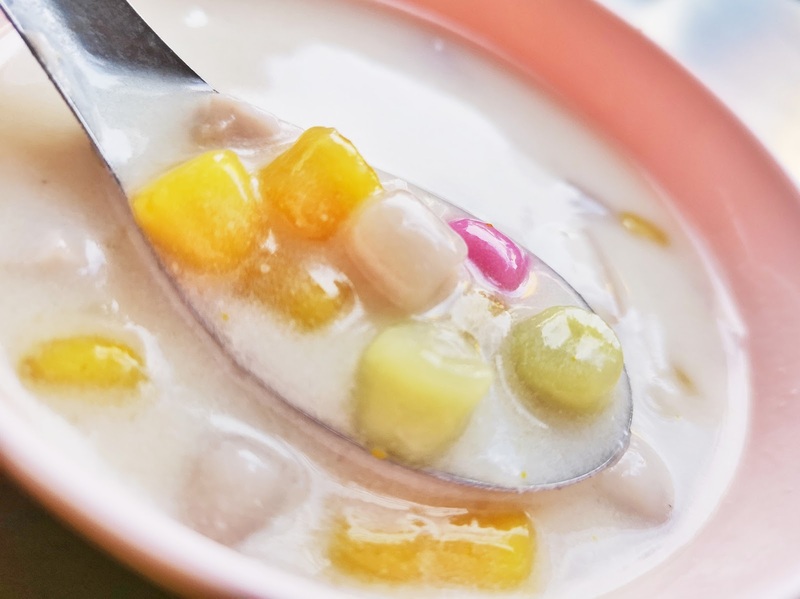 If you have a sweet tooth, you would probably like this. After the toast turned cold, it hardened. Honestly, it was way too sweet for my liking, I do not think I will buy again. 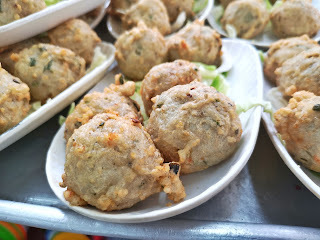 The above are some new stalls which I tried on top of those popular Tzhi Char Stalls. 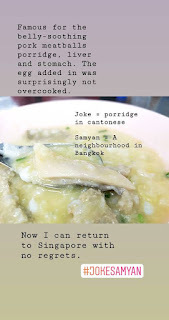 Next for the porridge lovers, if you are thinking of some belly-soothing porridge in Bangkok, I was brought to look for Joke Samyan (porridge in cantonese) with Uncle Daniel. But somehow the one the taxi driver dropped us at was different from the one he went to and to add on, that stall was not opened and we went back disappointed. During my extended stay with the family, Don had kindly brought me to hunt for it knowing that, I had to find it and try it before we return to Singapore. We found Joke Samyaan, I read that this stall has been serving the same breakfast for 60 years! 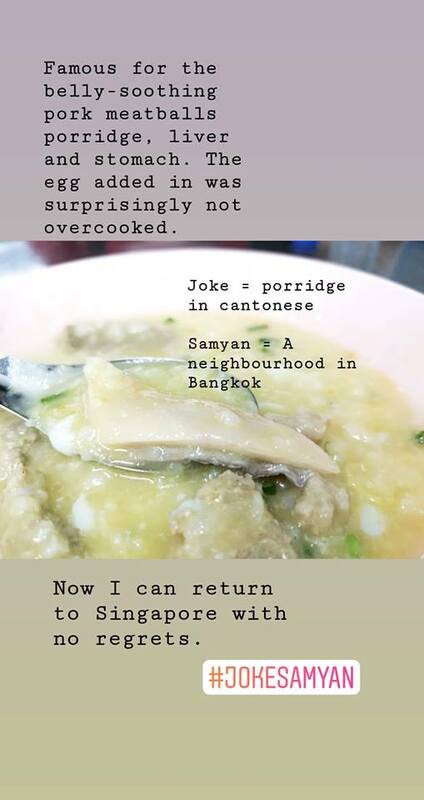 The ingredients were also freshly purchased around the neighbourhood! 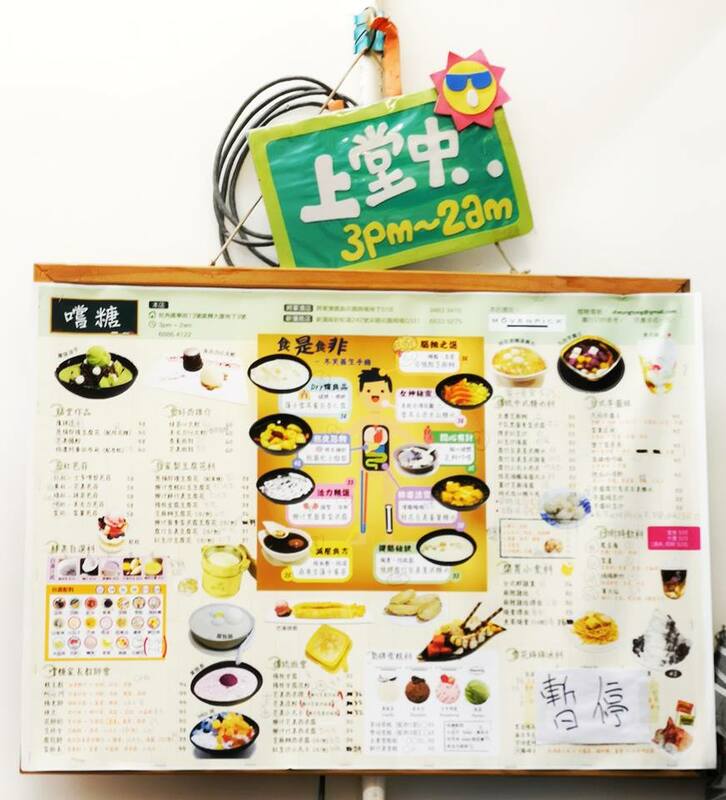 It opens twice a day as early as 5pm and lunch starting from 3.30pm onwards. By 4pm, we saw the local crowd streaming in and queue started forming. 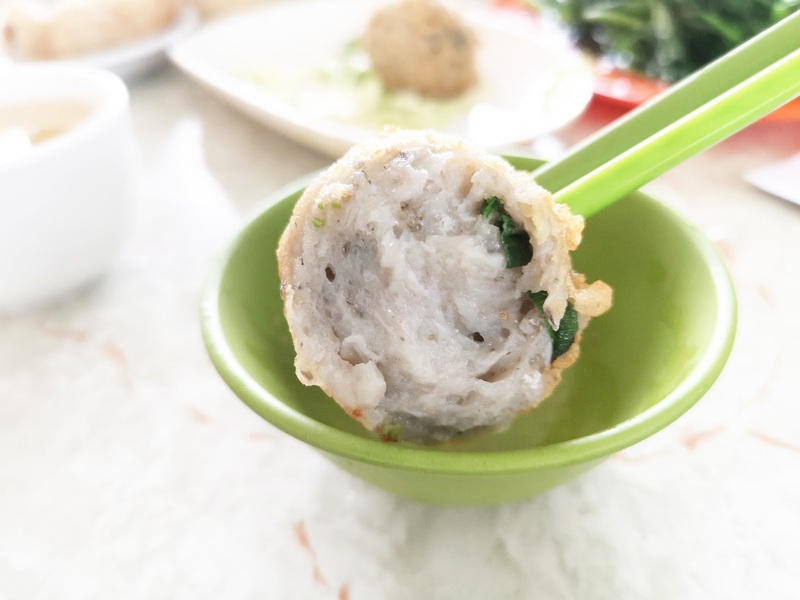 I ordered minced porkball porridge with an added egg, simple, flavorful yet comforting. 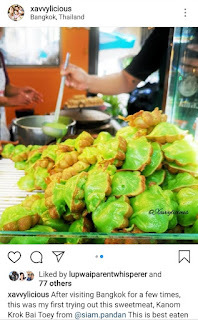 Next on, if you are in Siam Square vicinity, go look for this yummiest snack in Siam Square! 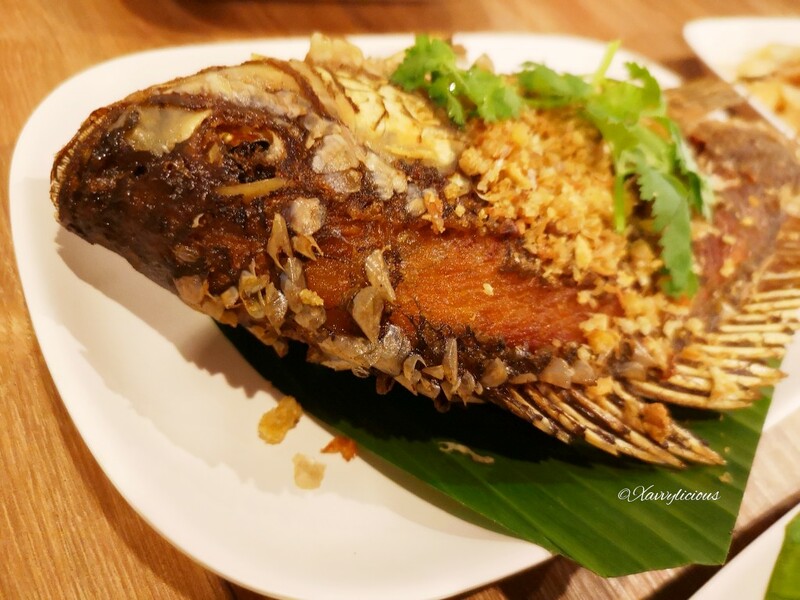 The little brown hut "Siam Pandan" is located right beside Novotel Bangkok on Siam Square. Also known as sweetmeat to the Thais, Kanom Krok Bai Toey is best eaten in their warmest state. It was soft and chewy when I sank my teeth in and not overly sweet. I bought around 5 boxes for the kids after their training. The boxes were gone within two minutes, totally irrisistable! 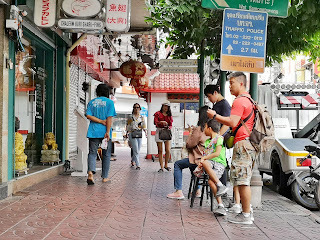 If you are facing Siam Pandan, walk towards your left (just two shops away), you will see a row of massage parlour. 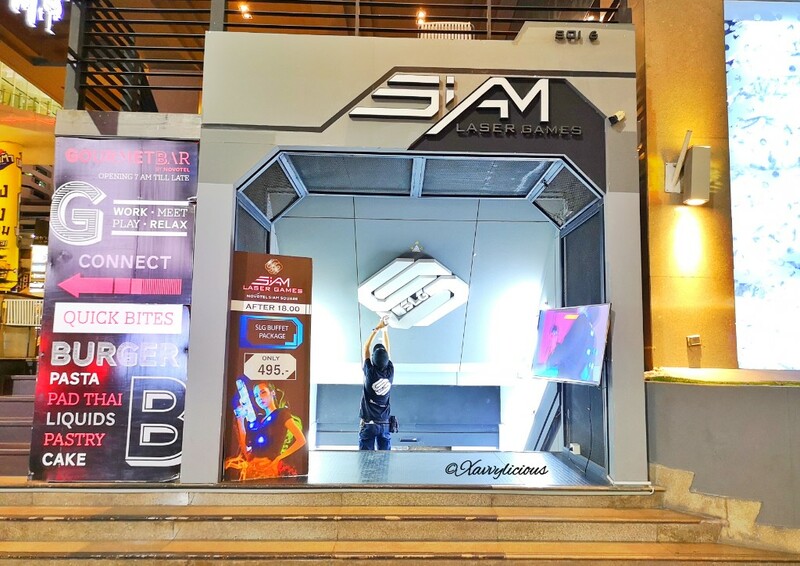 But on the right, you will see "Somtam Nua Restaurant" on the ground floor. 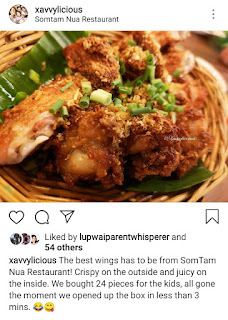 Go get the best wings from them! 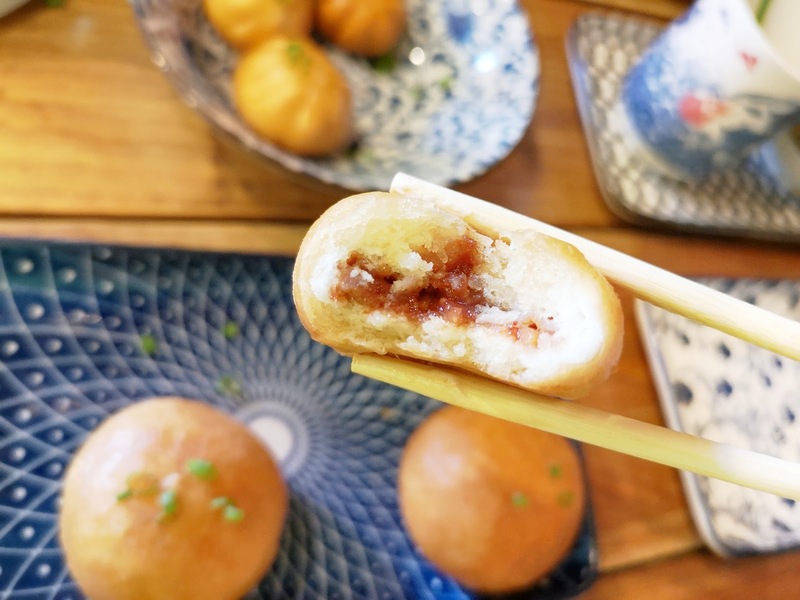 Crispy on the outside, juicy on the inside. 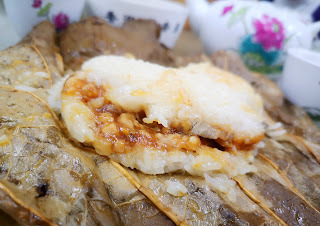 Super hot favourite among everyone! Usually, I do not fancy Papaya salad but the one at Somtam Nua was slightly different in terms of taste, kind of suit to my liking! 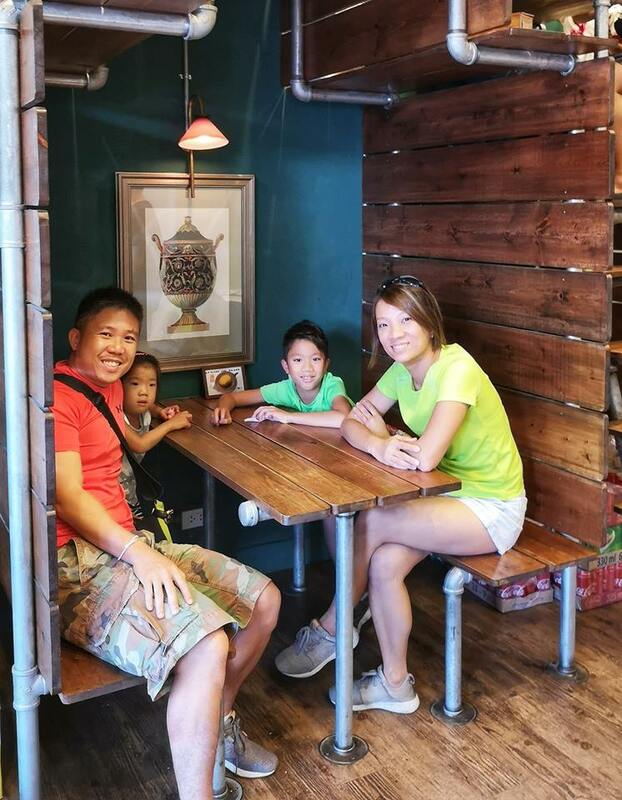 We orderd some kids-friendly dishes too since they little ones could not take spicy food. 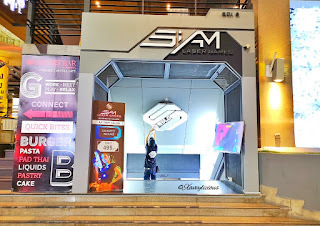 And in the same vicinity, just right at the corner on the right of Novotel Bangkok on Siam Square, there was a Siam Laser Game Centre. If I did not remember wrongly, it was unlimited hours if you book to play after 6pm. 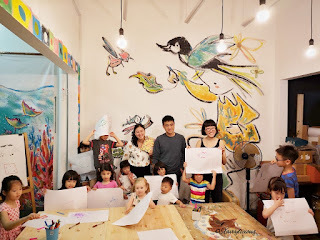 We paid $20 SGD for two hours of fun, quite a good deal right ?! 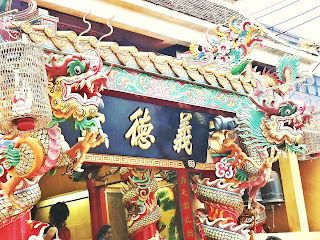 Last but not least, when we were on foot looking for the Jok Samyan, we walked past Sam Yan Station and chanced upon this temple. Suddenly, Don told me "Oh, this was the temple my friend brought me to last year to make coffin donations!" 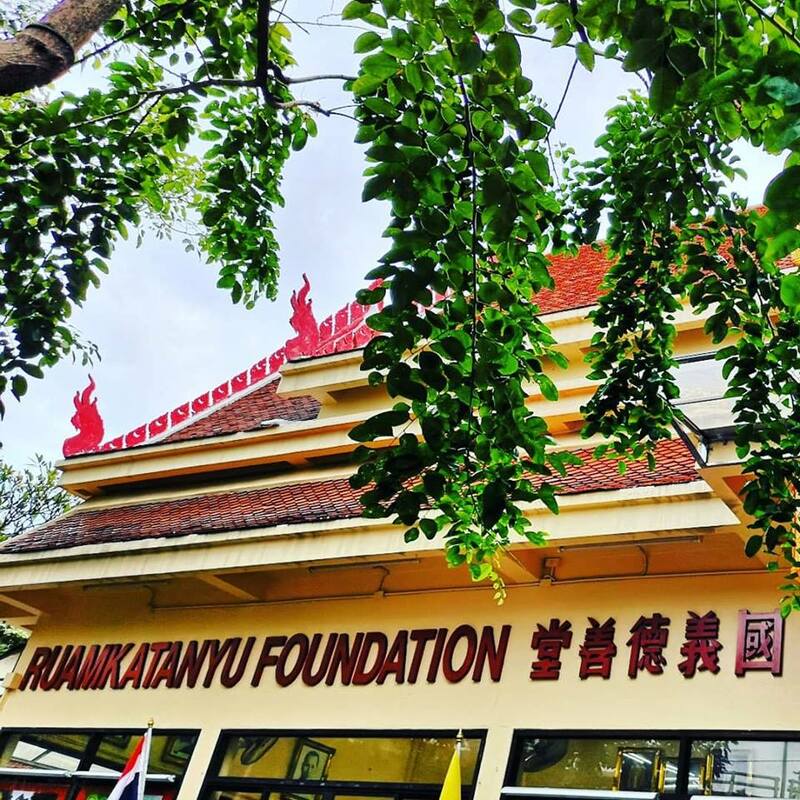 If you happen to be in Bangkok, if you are a Buddhist (or not) and wanted to do make some merits, you can always go to Ruamkatanyu Foundation, it is open 24 hours. Basically, donations are on voluntary basis but a donation of 500 Baht, the body will be entitled a coffin and a piece of white cloth. 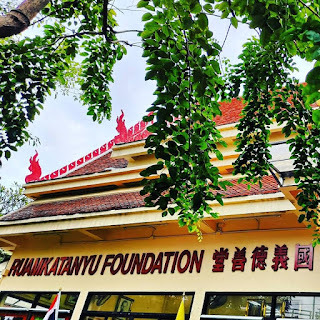 Ruamkatanyu Foundation (Bangkok) basically provides coffins for victims who were killed in accidents or murdered and with no next-of-kin to claim their bodies or low-income families that could not afford a coffin. Just head in straight to the counters and the staff will guide you should you be lost in what to do. 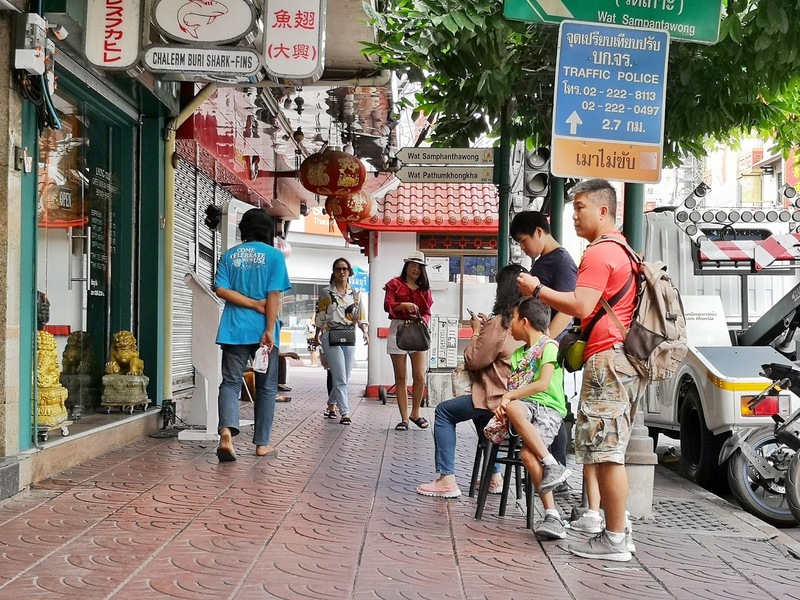 It is a very common practice among the Thais to make the world a better place! 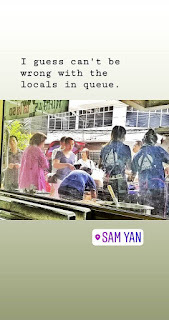 If you do have any recommendation on where to go and eat like a local, drop me a comment ! I hope you have enjoyed reading the post! 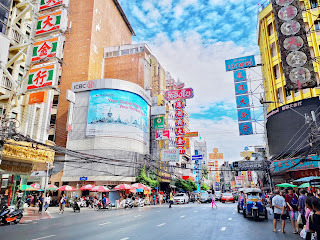 I have linked up all the Thailand related posts and hope it is useful for you! Step By Step Guide in making a Lantern out of Squares ! Embarking on Essential Oils for the family well being ! 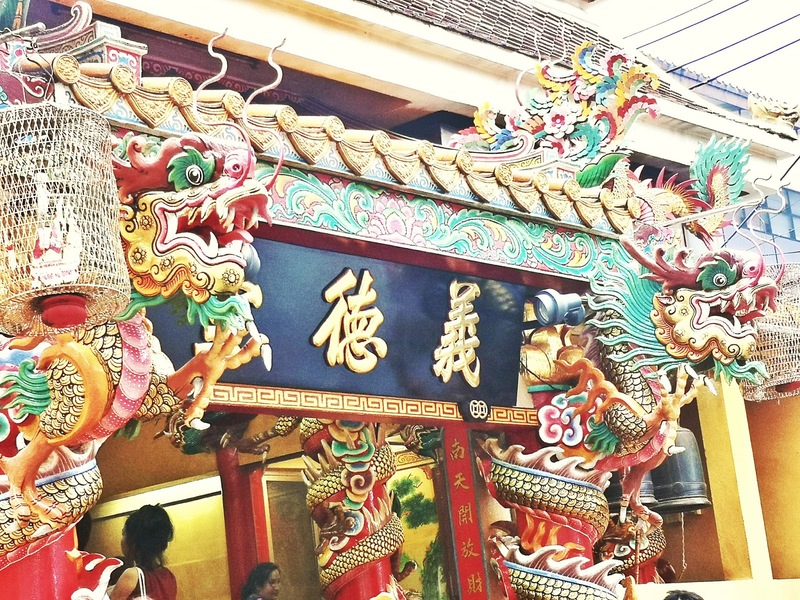 Singapore's largest thematic outdoor playground - Westgate Wonderland !